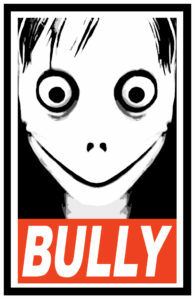 In 2018, following the “Momo Challenge” which is a form of cyberbullying that spread through social medias and cell phones, I made this sticker in the style of “OBEY” with the sculpture produced by special effects firm Link Factory. Posted in: everything, sticker, text. Tags: 2018, sticker.